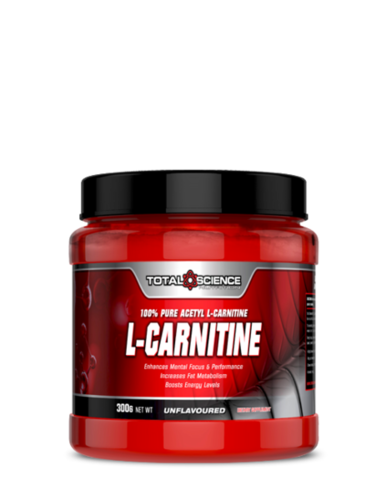 Total Science Acetyl L-Carnitine is 100% pure pharmaceutical grade, it is an acetylated version of L-Carnitine and is claimed to be the most efficient form of carnitine in terms of bioavailability. This naturally occurring amino acid can assist with your fat loss goals, it promotes the transportation of fat into the bloodstream where it can be burned as energy. Taking Acetyl L-Carnitine on a daily basis has been shown to support cognitive and neurological functions by crossing the ‘blood-brain barrier’, providing direct benefits to the central nervous system.